Read all of Elephant & Piggie’s funny adventures with the complete collection of all 25 titles. Create an instant Elephant & Piggie library with the sturdy metallic Elephant & Piggie bookends included with each set. 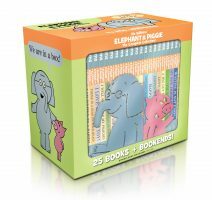 Mo Willems’ number one New York Times best-selling Elephant & Piggie series has won two Theodor Seuss Geisel Awards and five Theodor Seuss Geisel Honors! Collect them all in this deluxe box set.